Dr. Andrews is originally from Worcester, MA. She received her B.S. in biology from the University of North Carolina at Wilmington. She went on to receive her doctorate from Ross University School of Veterinary Medicine in 2009. 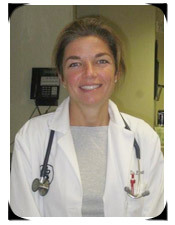 Her professional interests include internal medicine, dermatology, emergency medicine and exotic medicine. Outside of veterinary medicine, she enjoys New England Patriots football, surfing, travel and animal rescue work. She shares her time with a pit bull named Max and a feisty Westie named Brady.